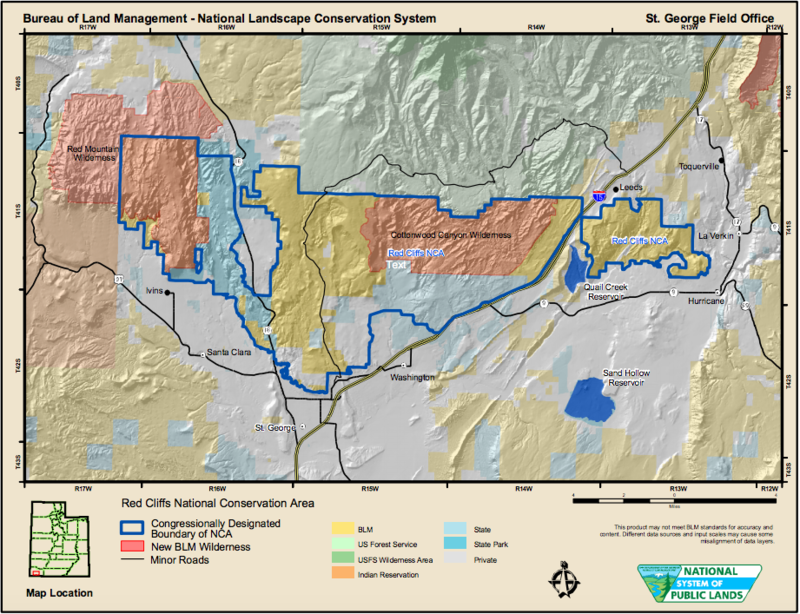 ST. GEORGE – It has been a long road, but the Washington County Habitat Conservation Plan has turned 20 years old – and expired – on March 14. However, the renewal process is ongoing. The Washington County Habitat Conservation Plan, which set aside 62,000 acres of protected tortoise habitat as the Red Cliffs Desert Reserve, has been controversial but effective. It has preserved the desert tortoise on the reserve while still allowing development to continue on tortoise habitat in other parts of Washington County. Washington County applied for renewal in January 2015, and U.S. Fish and Wildlife officials who oversee the process have said that the existing permit would remain in place even after the expiration date, as long as there are good-faith negotiations underway. The main obstacle to renewing the Habitat Conservation Plan has been acquiring the remaining private property within the reserve. The Mojave desert tortoise was listed as endangered by the U.S. Fish and Wildlife Service in 1989. In 1990, a steering committee was formed by Washington County, and in 1995, the Habitat Conservation Plan was submitted for approval. In 1996, the Habitat Conservation Plan was signed by Washington County, U.S. Fish and Wildlife Service, Bureau of Land Management, Utah Division of Wildlife Resources and Ivins City. With the signing of the plan, an incidental take permit was issued, allowing approximately 12,000 acres of tortoise habitat to be developed in other parts of the county. Of that 12,000 acres, only about half has been developed at this point. Washington County has spent more than $10.5 million to create and maintain the Red Cliffs Desert Reserve, Assistant County Attorney Eric Clarke told the Habitat Conservation Advisory Committee in a recent meeting. Costs include education, tortoise monitoring, habitat restoration and the purchase of grazing permits, as well as funding biologists and helping species besides the desert tortoise. The county now has a volunteer trail steward program, where people can volunteer to go out and help maintain the area. The county has also purchased and installed 85 miles of fencing along the border of the reserve. “If you look at the map of the Red Cliffs Desert Reserve, you can see that the entire southern boundary is surrounded by municipal development,” Clarke said. One benefit of the Habitat Conservation Plan agreement has been the preservation of a vast, beautiful area which has become popular with recreational users. Trails in the reserve are open to hiking, mountain biking and horseback riding, with some restrictions. BLM data shows that between October 2014 and September 2015, the Red Cliffs National Conservation Area saw 125,000 visitors, and the Red Mountain Wilderness area had 27,000. 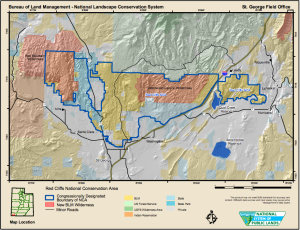 Those figures don’t take into account areas accessed through the Ivins and St. George or in Snow Canyon State Park, Habitat Conservation Plan administrator Bob Sandberg said. Acquiring the remaining private property within the reserve has been a sticking point and is the main obstacle to renewing the Habitat Conservation Plan agreement. U.S. Fish and Wildlife officials are not requiring that all private property be acquired before renewing the agreement, but they do want good-faith negotiations underway. A handful of property owners still hold 1,288 acres within the reserve, and the remaining private property must either be purchased outright or traded for land of equal value. Developer Bob Brennan is the largest landowner, with approximately 800 acres still in the reserve. 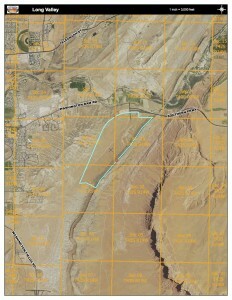 Brennan has been pushing for cash payment or exchange property of equivalent value; however, his proposal for an exchange involving land in the Sand Hollow State Park/Sand Mountain off-highway vehicle area has been met with vigorous opposition from local off-road users and groups. Another exchange of Brennan’s property for 600 acres in the Long Valley area is moving forward without controversy. This acreage could be exchanged for between 80 and 180 acres of Brennan’s land in the reserve. The final numbers depend on the appraised value of the two properties. Money for purchasing property outright has been hard to come by, although officials have made repeated efforts to secure funding through Section 6 of the Endangered Species Act, the Land and Water Conservation Fund and other sources. 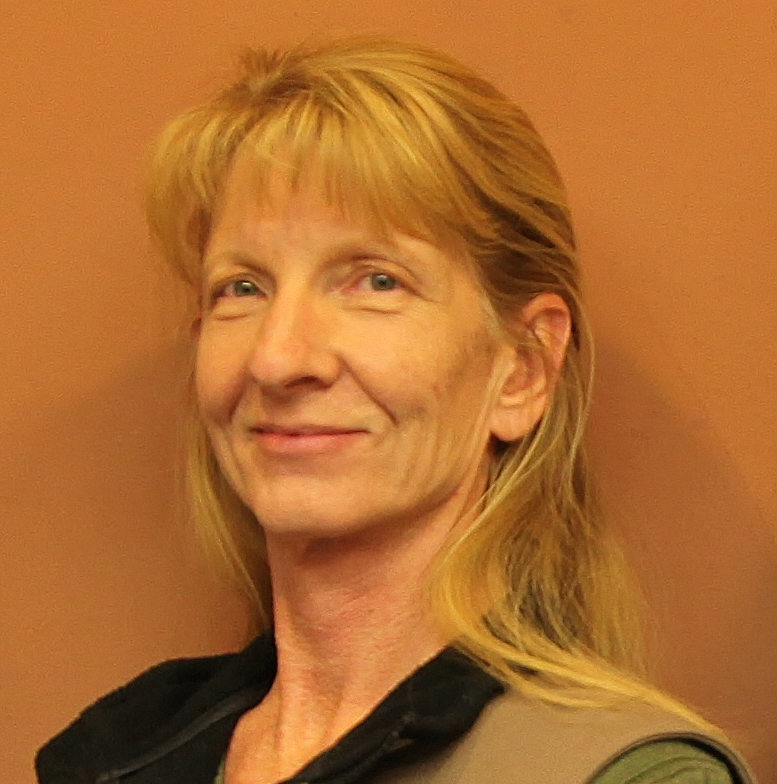 Dawna Ferris-Rowley, who manages both the Red Cliffs and Beaver Dam Wash national conservation areas for the BLM, has also been working to find funding to acquire property in the Red Cliffs Reserve. 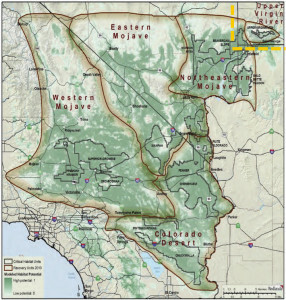 Approximately $800,000 has become available from previous sales of BLM property, Ferris-Rowley told the Habitat Conservation Plan advisory committee March 22, and another sale is underway on six parcels of BLM land. Money raised from that sale will be available for the purchase of inholdings, Ferris-Rowley said. This is a wonderful effort. Please work to renew it and preserve our natural habitats. Let it expire. It has been a massive boondoggle with lots of corruption. Land has been reclassified repeatedly to benefit people financially (the corruption was so bad it garnered national attention: http://www.deseretnews.com/article/771645/Land-exchanges-are-riddled-with-abuses-GAO-says.html?pg=all). Case in point: Where Paradise Canyon is I repeatedly saw many tortoises while mountain biking, but that land was declassified as desert tortoise habitat and land west of highway 18 that is covered in black lava rock was classified (the act specified that 62,000 acres had to be set aside, but it didn’t say ~which~ 62,000 acres) in its place. I’ve been up there many times and have never seen a tortoise, or any signs of one. Unless they have titanium claws I doubt they could burrow down into the lava rock to live. The act was created to benefit, empower, and enrich certain individuals, not to protect tortoises. Let it expire. I’m not sure that the land swaps you refer to are part of the Habitat Conservation Plan which is up for renewal and the focus of the article. I agree that there are many abuses involving land swaps in Utah like some with SITLA and the egregious land swap that deprived Snow Canyon State Park of a wonderful view so that The Ledges development could build out right to the edge overlooking the Park. There are still plenty of tortoises in the Paradise Canyon/Chuckwalla area and it is part of the Red Cliffs Conservation Area. I don’t know about the area to farther north and west on State Route 18 though. Like you say, it is lava rock. Overall, I’d say the HCP was a success. Brian seems to know more than many of us about what this effort has really produced, but I can say that I have never seen a tortoise in the area covered by the preserve from 1970 until now. And I understood that, a number of years ago, scientists came to the conclusion that many of them had died off during a bad weather cycle (drought or storm, I don’t remember). I’ve only seen wild tortoises living in the Las Vegas area and in the Valley of Fire during this entire time period. We should definitely keep the Red Hill as a recreation and nature area and out of the developers’ greedy hands, but not because of any tortoises. Besides that, they were brought here by humans. They are NOT native to Southern Utah. Actually, the St. George area is the northern most part of the Mojave Desert. It has many of the native species of the rest of the Mojave Desert including the Desert Tortoise. They are quite difficult to spot, only coming out during certain times of the year and certain times of day. And, they look like your basic rock unless you look carefully. I’ve seen as many as twelve in a two mile area, right along the trails and have talked with the employees of the Reserve who map their locations and count them. They are amazing creatures and I’m glad they are protected. Such a failed experiment. Let it expire. I have not seen a single tortoise in many years of hiking and recreating in the area. The HCP is rife with greed and corruption. It’s time to end the corruption and give the land back to the people. I like the tortoises and the desert reserve. I think it is money well spent. I guess $169.35 per acre is a little spendy. Of course, that would be $8.46 per acre per year which is actually pretty reasonable if you ask me. They could probably get that cost down. Perhaps we could use inmates to build the fences and pick up garbage to save money. 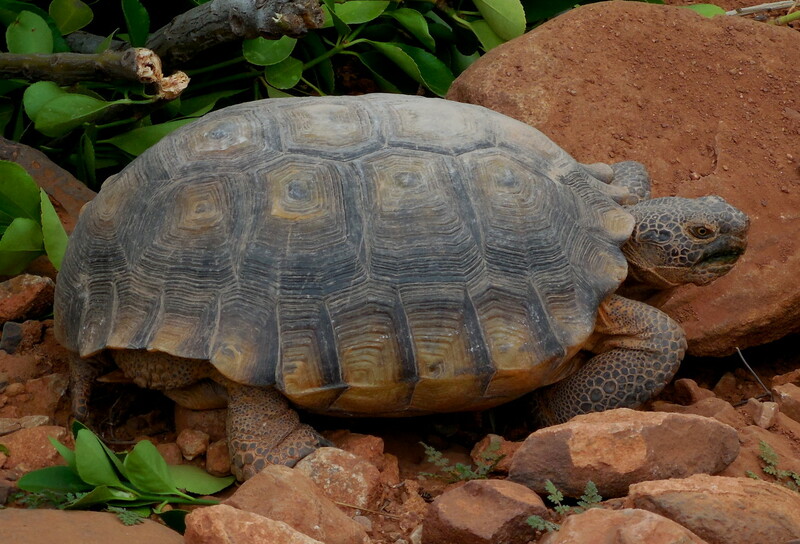 By the way I have seen three desert tortoises in the last year. Two on the powerline trail and one out in elephant arch both of which are located in the red cliffs desert reserve. I’ve been in St George for 4 and 1/2 years and I’ve never seen a turtle. I haven’t looked for one either. Close to my apartment I’ve seen bunnies, ducks, a roadrunner, 3 deer, and frogs and my complex says no animals allowed haha…all but the deer were on the property. The deer were in the back on the trail by the river. Where are the turtles? We see turtles out here all the time where we live. every now and then we have to get out of the car and carry one across the street so it doesn’t get ran over. ..it’s kinda cool to see them just keep moving on after you set them down and it’s like nothing ever happened as they just go on their business. Uh-oh. dot boy just confessed to breaking both FEDERAL AND STATE LAWS! Well, we need to publicly condemn this person that somehow thinks he is above the laws that ‘we the people’ allowed to pass. Now go turn yourself in before you get stopped at a roadblock and taken down like the domestic terrorist you are. You’ll get the same support from us you gave the Bundys, you law breaking criminal. Section 7 requires Federal agencies to carry out conservation programs and to ensure their actions will not jeopardize the continued existence of any listed species or result in the destruction or adverse modification of critical habitat. Section 9 prohibits take**. Section 10 concerns habitat conservation planning. On another note- good job on saving the tortoises! I’ve seen a few crushed on the road because traffic didn’t see them or people just didn’t take the minute to let them pass. The conservationists in charge of the habitat area, estimated and reported about 50% of the Tortoise population were killed in the burned (habitat) area. This was the direct result of closing of the area to motorized vehicles. The established roads acted as a fire break. Stopping motorized vehicle traffic through the habitat area let those roads reseed and become overgrown with cheat grass….Heavy rains in 2005 increased cheat grass and other vegetation in the area. When it burned (lightning strikes), the roads that acted as firebreaks (pre habitat) were no longer there, or were now covered in dry vegetation, the fires burned uncontrolled and took out the tortoises also. Firefighting was also hampered because motorized vehicles were not allowed to be used to fight the fires. Tortoise Population has actually gone down because of the Million$ of dollars being wasted on a political agenda…typical SNAFU when government is involved. I’ve lived here since before the freeway. People use to drill a hole in the back of the shell and chain them in the yard. They would go around in circles eating grass and what ever you gave them. The hole would finely ware through and they would escape. Now days they have learned to die if you touch them. I wonder what changed? Wow that’s amazing the RealMcStupid attempted to make an intelligent comment twice on one article. Oh well one of these days.